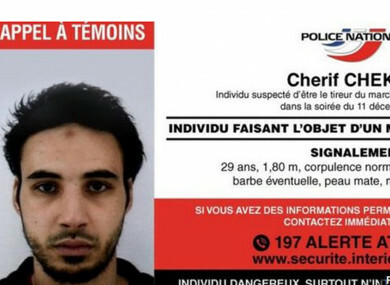 A wanted poster for Cherif Chekatt, the suspected killer in the Strasbourg attack. A photo of Cherif Chekatt (29) who was born in Strasbourg, was distributed publicly yesterday evening. “Dangerous individual, above all do not intervene.” It asks anyone with information that could help locate him to contact authorities. Hundreds of police and soldiers were combing Strasbourg in a search of him, blocking bridges that cross the border into Germany. Prime Minister Edouard Philippe announced a strengthening of security forces to secure Christmas markets. Meanwhile, the Department of Foreign Affairs has advised Irish people in France to exercise a high degree of caution while travelling in the country. “The Embassy is monitoring the security incident in Strasbourg. Heightened security measures are in place in the area. French police advise those in the area to remain vigilant and follow the instructions of the local authorities,” the DFA said. Chekatt opened fire with a handgun and stabbed passers-by during his rampage, France’s anti-terror prosecutor Remy Heitz said yesterday. Chekatt was flagged by French security forces in 2015 as a possible extremist while in prison, after he “called for practising a radical form of religion,” deputy interior minister Laurent Nunez told France Inter radio Wednesday. The gunman then fled the scene in a taxi, getting out in the city’s southern Neudorf district, where he again exchanged fire with police before disappearing, a source close to the inquiry told AFP. Email “Police release image of Strasbourg attacker suspect as Irish visitors to France told to exercise caution”. Feedback on “Police release image of Strasbourg attacker suspect as Irish visitors to France told to exercise caution”.